It’s a new year and a new hair color for Ivanka Trump! The businesswoman daughter of Donald Trump and “Celebrity Apprentice: All Stars” judge has changed up her signature look, darkening her blond locks to a chestnut brown hue. She debuted her hair makeover on Twitter this week, sharing snapshots of a business trip in Uruguay. 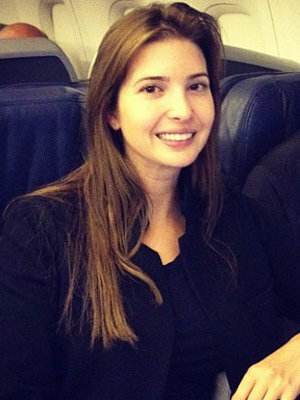 In one photo, she’s seated next to her younger brother, Eric, on a plane and her dark brown hair is styled straight in a casual ’do. In another snapshot, she shows off a more glam style (below) – her locks are wavy and worn to one side as she strikes a pose at one of the Trump properties. No word on when she made the change, but last week she was a blonde when she posted this sweet photo of her with her 1-year-old daughter, Arabella, at the Trump Invitational Grand Prix equestrian event at The Mar-a-Lago Club in Palm Springs, Florida. Trump, 31, is known to play with her look – memorably debuting bangs at the Met Gala in May 2012 and rocking an ombre style a month earlier at the Tribeca Film Festival – but she largely sticks with a blond hue, which is why her makeover caught our attention. However, when she was younger she had darker hair, so this seems closer to her natural color. Either way, fans of “Celebrity Apprentice” shouldn’t expect to see Trump as a brunette when the show returns in March. Shooting wrapped last year – long before her makeover.